Markus Fräger’s works on canvas invite fascinating glimpses behind the concealed walls of private spaces. His painted interior scenes usually concentrate on two or three standing or seated persons who are either in conversation with each other or are immersed in themselves. The rest of the space is wrapped in darkness with brighter passages only where they are required for the composition. 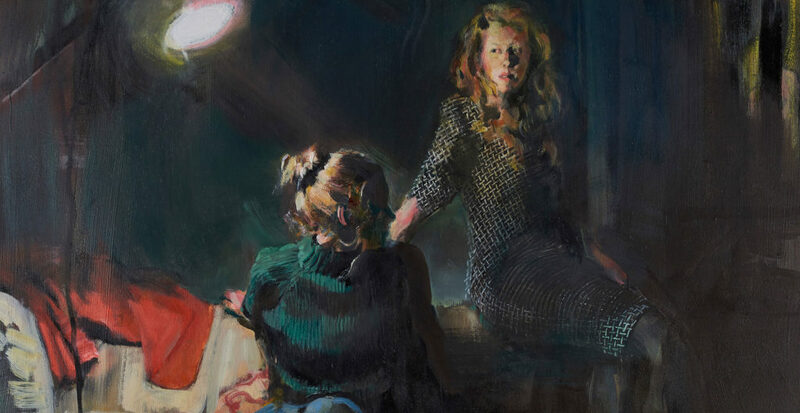 The viewer, whom the persons in the focus of the depiction only rarely look at directly, discovers little about the protagonists or the situation in which he now involuntarily finds himself. It involves situations that affect the viewer like film stills, screenshots or candid photos. Markus Fräger’s pictures are characterized by this photographic momentariness and the accompanying intensity of moods that can be sensed in his staged spaces. The dramatic chiaroscuro recalling Italian and Dutch masters of the Baroque period like Caravaggio and Rembrandt is a remarkable aspect of his painting style. He acquired a solid knowledge of such traditional painting techniques while studying art history in Münster. You can look forward to becoming acquainted with a group of fascinating and suspenseful works by the Cologne artist Markus Fräger in our gallery spaces in Weidendamm. Sabine Christmann creates unparalleled works based on the traditional oil-on-canvas technique which reflect our everyday living environments. 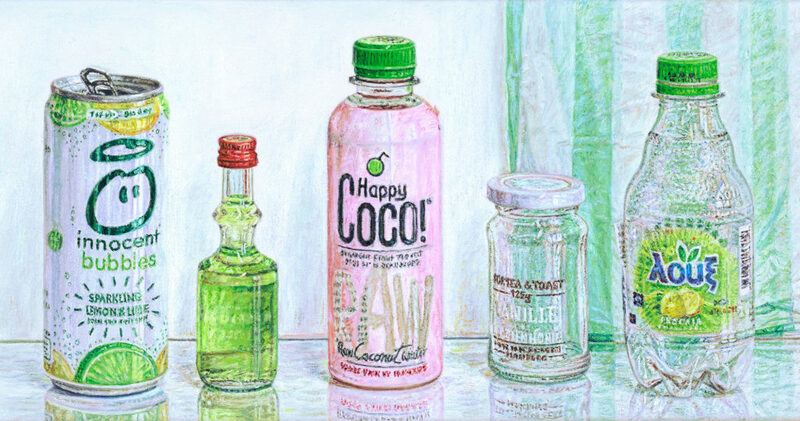 The artist makes use of such routine and banal items of today’s modern consumer society as shopping bags, glass bottles and cans in order to paint light-filled still lifes. These objects encounter persons as if on a stage in her arrangements that are coordinated in detail with a view to color and composition. The “play” that they perform remains puzzling and ambiguous. By depicting empty vessels, Sabine Christmann metaphorically portrays the apparent significance that modernism finds in the external form. In the process, the delicate still lifes generate an illusion of reality on the smooth mirror-like surface. Not only painting itself, which is sensually tangible in the surface properties of its materiality, but also the occupation with her own perception is of central importance for the artist. Sabine Christmann studied in the mid 1980s at the Kunstakademie Karlsruhe with Prof. Peter Dreher and at the Kunstakademie Stuttgart with Prof. Rudolf Haegele. She lives and works in Bartenstein. Thursday, March 21, 2019, 7.p.m. The Gallery is closed for easter from April 19 – 22, 2019.